Nato Soldier Who Killed Four Macedonians Released. Norwegian courts acquitted of all charges NATO captain Westley Christian , who (while driving in a wrong lane) in August of 1999 caused a car crash on the VelesSkopje highway killing the then minister without portfolio Radovan Stojkovski, his wife, one of his two children and his chauffeur. The Borgating Court of Appeal in Norway acquitted NATO captain Westley Christian of the responsibility for the car crash on the Veles - Skopje highway of three years ago, killing the then minister without portfolio Radovan Stojkovski, his wife, one of his two children and the chauffeur. The accident happened when the NATO vehicle, driven by Christian in the unpermitted direction on the one-way highway, violating thus all international traffic regulations, collided directly with the ministers car. The Norwegian soldier will not be held accountable even for negligence. The NATO notification sent to the Macedonian ambassador to Oslo relates that the Court of Appeal acquitted captain Westley of the charge of causing death to another person or persons out of negligence, as well as of the charge of careless and irresponsible driving. The Court reached its ruling in the presence of three judges and four members of the jury after having examined all the circumstances of the accident, in particular the conditions on the road and the location of the road signs. The Court also took into account the analysis of the Macedonian court experts. The NATO notification further relates that the Norwegian public prosecutor, after the jurisdiction over the case was taken from the Macedonian and conceded to the Norwegian judicial authorities, during the first-instance procedure requested of the Macedonian authorities more details and information concerning the case, but received none. By the time certain incomplete records reached Norway, the litigation had already entered its second stage at the Borgating Court of Appeal. The Court of Appeals ruling is finite and irrevocable, says the notification NATO sent to the Macedonian authorities. The prosecutor, however, lodged a compliant with the Supreme Court. It is uncertain though whether it was approved. Although the Norwegian and the Macedonian authorities pledged indemnity of up to half million euros for minister Stojkovskis survived child and for the chauffeurs family, nothing has come of it yet. As early as two years ago, legal experts said that Macedonian authorities lost the case once they agreed to concede the prosecution of the NATO soldier to the Norwegian legal system and released him from the prison in Skopje. When the prosecution began, the charge of murder was skewed into a petty offense despite reactions from the Macedonian side. When the crime was ultimately defined as an act of negligence, the captain complained once again whereupon the Court of Appeal reached the ruling of release. SESSION OF THE MACEDONIAN GOVERNMENT. Prime Minister Ljubco Georgievski and all other members of the Government have agreed that the social package and benefits that belong to employees of the loss-making companies, on the ground of pension, disability and health care insurance, should be paid in a manner that would be satisfactory for all of them, spokesman of the Macedonian Government Gjorgi Trendafilov said Tuesday. He said that at yesterday's regular session, the Government adopted a decision of the Ministry of Agriculture, Forestry and Water Supply, to pay Denar 2 to every cattle breeder for one liter of bought milk, as a compensation for the suffered losses due to the drought. Yesterday, the Government did not discussed on appointing of new chairmanship of the Coordinate Crisis Management Body. "The new chief of this body will be most probably appointed in the next few days. Prime Minister Georgievski will chair the body's meeting, scheduled for tomorrow, " Trendafilov said. At yesterday's session, presided by Prime Minister Ljubco Georgievski, the Macedonian Government reviewed and adopted the proposal for determining the buyout price for the cow milk. Regarding the fact that the milk production in Macedonia is on a quite a low level and without any control, as well as due to the need for regulating the buyout of the raw cow milk, this sort of decision was necessary, because there is no other act that regulates this matter. With this decision, problems of the milk producers regarding the buyout price and improvement of the milk quality will be partially surpassed. Also, with this act, Macedonia approaches to the EU standards. At the session, the Government also adopted the balances for the elementary agricultural and food products for the year 2001/2002, developed in order to monitor the supply with these products and the need for launching appropriate activities and measures. The balances also determine the main commercial needs of the Republic of Macedonia from these products, which are vital for the population and the reproduction. The Government reviewed and adopted several decisions for determining customs contingents for export of refining oil, meat, sugar and other products. The Government also adopted an information for realization of the projects that are financed with the funds from the sale of the "Macedonian Telecommunications" in 2001. Conclusion was that in 2001 54,9% of these funds have been realized. This dynamics caused certain problems in the realization of the projects planned for 2002, and for that purpose, the Government obliged the holders of the projects to determine new dynamics according to the new priorities for financing. Realization of the projects planned for 2002 will be postponed in order the priority projects from 2001 to be completed. In the framework of the two-day official visit to Sophia, Macedonian Minister of Defence Vlado Popovski is to meet Wednesday the Bulgarian President Georgi Prvanov, as well as the Prime Minister Simeon Saxe-Coburg Gotha. On Tuesday, Minister Popovski had meetings with his Bulgarian counterpart Nikolaj Svinarov, with the Diplomacy Chief Solomon Pasi and the Deputy chairman of the Bulgarian National Assembly, Blagovest Sendov. Macedonian and Bulgarian Defense Ministers Vlado Popovski and Nikolay Svinarov talked Tuesday about the mutual interests and the joint cooperation between the two countries at the meeting in Sofia, MIA's special correspondent reports. Protocol on cooperation between the two defense ministries was signed, which refers to the training, education, specialization in certain areas, sharing experiences on security topics as well as about the legislation in the defense. Minister Popovski, emphasizing that Bulgaria was very important strategic partner of Macedonia in the process of its stabilization and integration within the Euro Atlantic associations, stressed that there is comprehensive cooperation and support from Bulgaria, that was very important in providing the security, the integrity and the independence of Macedonia during the crisis. "There is continuos and complete cooperation between the defense ministries of two friendly countries," Popovski stressed. Answering a journalist's question, Minister Popovski pointed out that there were different estimations regarding the chances for renewal of the crisis during springtime. "All forecasts have something in common - the new crisis can not have the strength and the extent of the previous one," Popovski added. He said that "new situations occurred in the mean time and new factors for peaceful resolution of the crisis were created," mentioning the signed Ohrid agreement, which was partially implemented in the Macedonian Constitution, the adoption of the Law on local self-government as well as the redeployment of the police forces in the crisis regions. According to him, the international community thought that the realization of the plan was according to the schedules, so not a single political excuse for renewing the crisis could be internationally supported. "Macedonia has full capacity as sovereign country to act according to the Constitution and to be internationally supported in the same time. We have estimations that the ethnic Albanians in Macedonia do not support new military adventure, and Macedonia has increased capacities for resolving the eventual crisis," Minister Popovski was decisive. According to Bulgarian Minister Svinarov part of the signed Protocol was the process of continuation of the military-technical cooperation between the ministries, except the heavy arming. In that respect, Minister Popovski stressed that Macedonia has enough weapons and the additional heavy arming is not necessary, although there is need for combat kits, ammunitions and new radars in the Army, which is part of the professionalization envisaged in the Defense Ministry's program for 2002. Yesterday, Popovski also had a meeting with Bulgarian Foreign Minister Solomon Passy this afternoon, at which they discussed bilateral relations, and concluded that there were no open issues between the two countries. It was estimated that the relations between Macedonia and Bulgaria were developing and that conditions for closer cooperation between the citizens were created. Emphasis was put on the development of the infrastructure and the economy, as the only basis for prosperity of the countries in this region, especially for Macedonia and Bulgaria. Ministers Popovski and Passy especially referred to the future activities of the realisation of Corridor 8. "Bulgaria and Macedonia are serious candidates for NATO membership, and we expect to receive an invitation to attend the Summit of the Alliance in Prague. The more we cooperate, the more chances we have to become EU and NATO members", Bulgarian Foreign Minister stated after the meeting. He emphasised that Macedonia had important strategic infrastructure projects, before all Corridor 8, in which framework was the building of railroad Sofia-Skopje. Passy said that the railroad was very important for the entire Balkan region and was of strategic interest for both countries. Macedonian Defense Minister had a short meeting with Deputy Chairman of Bulgarian National Assembly Blagovest Sendov this afternoon, at which they discussed the situation and the activities of the Assemblies in both countries. The two interlocutors also discussed the ratification of certain agreements between the two countries. SMALL AMOUNT OF WEAPONRY ENTERS MACEDONIA THROUGH KOSOVO AND ALBANIA. A small amount of weaponry still enters Macedonia through the illegal crossings on the borders with Kosovo and Albania. According to the Ministry of Interior, KFOR confirms such information and adds that "situation is far from alarming, as the amount is small," i.e. insufficient for a fresh "spring offensive", which according to the information should be carried out by members of the Kosovo Protection Corpus (KPC). The offensive should take place not only in Macedonia but also in southern Serbia.. Interior Ministry sources hailed attempts of the former members of the so called NLA i.e. Ali Ahmeti and his cooperates, to convince the international community that they are against fresh military actions in Macedonia, imposed by clashes ANA's extremists. In the last week, the Ministry of Interior registered some shootouts between the former members of NLA and certain ANA's members, i.e the Albanian extremists who wish to continue their military activities on Macedonian territory. According to unconfirmed findings, he provocation started with a murder attempt activities started of the former self-proclaimed NLA's commander, Hodja i.e. Djezair Sakiri, who was wounded and stationed at the US military base in Kosovo "Bondsteel". Ridvan Neziri, or a group of people close to him, are the possible suspects. The Ministry of Interior has confirmed information regarding the existence of an armed group of 300 persons, former members of NLA, which should confront the extremists of the so - called ANA, willing to continue the military activities. 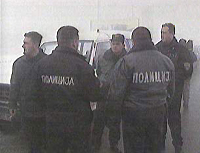 The formation of the group leads to the assault and wounding of the Albanian citizen, known by the name of Kuksi, by the former NLA's members. Kuksi is claimed to have stopped the patrolling of the mixed police teams in Teke district. "There is a certain group of people known to Ahmeti and his collaborators and we expect future shootouts, especially in Tetovo region," Interior Ministry's sources say. According to representatives of the international community, Ahmeti stands behind his statement, saying that he is against future military activities. On the other hand, these 300 fully armed persons prove the fact that NLA does not handed over its entire arsenal of weaponry, which leads to a possibility for fresh armed activities, the sources say. The Ministry of Interior believes that the four terrorists from Radusa, part of a six-member NLA group for which the international representatives requested additionally to be pardoned, should not be amnestied. The Ministry of Interior supports this position with the evidence material gathered for these persons. The citizens of Radusa do not allow ethnically mixed police teams to be re-deployed to the village without these three persons to be amnestied, which is why the process of redeployment has not even started in this region. Sources from the Ministry of Interior reported that at yesterday's meeting between Minister of Interior Ljube Boskovski and ambassadors of NATO, OSCE and EU, as well as EU Special Envoy to Macedonia Alain Le Roy, it was requested from the Ministry to submit an opinion to President Boris Trajkovski if the four imprisoned former NLA members should be amnestied. Officials from the Ministry said that the case with the beaten citizen of Tearce was used by some Albanians as motive for frightening of the local population and its displacement. Due to this, and due to the possible misuse of the eventual withdrawal of the police posts, i.e. reduced police presence in certain regions, Minister Boskovski asked from international representatives to provide additional mechanisms for prevention from such events. He even asked from them to sign a document pointing out the mechanisms, but they refused. Sources from the Ministry claim that the international representatives have no concept how to prevent this. "Le Roy is not ready to pay a visit to Zilce and Ratae and to talk to the villagers, who do not allow the "Lions" units to be withdrawn from there," they say. The international representatives insisted the "Lions" to be withdrawn from these two villages and to be replaced with regular police and army units. Officials from the Ministry of Interior say that if there was such decision, the "Lions" would be withdrawn from Ratae and Zilce, moreover because most of the unit members were currently on military exercise with the members of the antiterrorism police and army units which started on January 18. This training should be executed by members of the police and army units from the joint police and army antiterrorism unit. The second training course for the police officers - most of them Albanians, run by the representatives of the Organization for Security and Cooperation in Europe (OSCE) will start on February 11 and according to the Interior Ministry 250 persons will attend it. The activities of the Interior Ministry aim to increase the number of the Albanian police officers in this sector, as well as the policemen from other minorities in order to realize the obligations arising from Framework Agreement. According to the agreement, the number of the Albanians in the police should increase by the end of 2003 in order to match the percentage of the Albanians in the Macedonia's population. The course will be attended by 50 Macedonians, 150 Albanians and 50 persons from the other minorities and will be carried out in two stages from February 11 - March 4. The training will be conducted by the US instructors and will last three months. The persons that attended the first course are already on field training and after the passing of the state exam will become "officially authorized persons" and will be involved in the field activities of the Interior Ministry. The third training course is expected to begin on May 6, 2002 and should be attended by 250 persons. 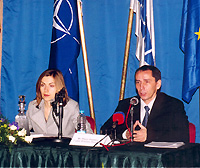 JOINT PRESS CONFERENCE OF NATO, OSCE AND EU MISSIONS TO MACEDONIA. "The outcome from the police redeployment in the crisis regions has been positive so far and we hope that there will be no halt in the process," OSCE spokesman Florin Pasniku told at the press conference on Tuesday. According to him, the police redeployment in Kumanovo's village Matejce is a significant step towards the confidence building. Pasniku informed that the process of redeployment has been completed in 15 villages, it is almost completed in four villages and OSCE teams and the police advisors assist to the police to enter in other 33 villages. "Everyone is prepared for the implementation of the revised Plan on police redeployment," Pasniku announced, expressing hope that the police would return in the first group of villages located around Grupcin, near Skopje as well as in six other villages in Gostivar area. He explained that the Plan on police redeployment has not undergone big changes, and refers to the gradual return of the police and providing security and freedom of movement for everyone. The incidents that occurred in Tetovo village Tearce when the advisor of Tetovo municipality Pavle Todorovski was beaten and in Tetovo Teke when two armed persons obstructed the police patrolling, according to Pasniku negatively affects the confidence building in that area. EU spokesperson to Macedonia Irena Gjuzelova spoke of Monday's meeting in Brussels among the foreign ministers of EU member-countries, who welcomed the adoption of the Law on local self-government, but also requested the adoption of the other laws arising from Framework agreement. "They want Law on amnesty to be passed," Gjuzelova said. According to her, the foreign ministers of EU's member-countries were concerned as "the political parties threaten to the independent media and to the persons working in the organizations for protecting the human rights." 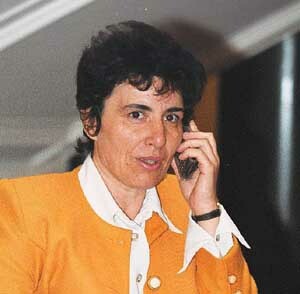 Reminding that Euro Commissioner Chris Patten has announced on Monday that the donor's conference for Macedonia would be conveyed on March 12, 2002 Gjuzelova explained that the means would be provided for macroeconomic assistance, reconstruction of the conflicted areas and will cover the expenditures for implementation of the Framework agreement. "The commission on donor's conference already makes the preparations, reviews the documents and statistical data and makes the final estimations on the costs of the implementation of the Framework agreement," Gjuzelova said. She explained that the donor's conference would be held on March 12 and not earlier, not "because of the political reasons, but because more time is required to make all necessary preparations, to include the latest statistical data and to give time to the potential donors to see all expenditures." At Wednesday's meeting between President Boris Trajkovski and the leaders of the four political parties-signers of the Framework agreement, the parties will state their priorities regarding the legislation process in the country. "The parties reviewed the laws that should be adopted according to the Framework agreement and we have requested from them to state their priorities," she said, stressing that one of the priorities of the European Union is to adopt Law on amnesty. Advisor of NATO's Secretary General George Robertson, Mark Leighty told the press conference that it was very important to adopt the Law on amnesty as soon as possible. "Some believe that the amnesty means that the persons that have committed crimes would be liberated, but this is more practical issue. The persons that are out of the society are the greatest threat for that society. If you are a person who wants to be reintegrated in the society, but you live in a small village in Macedonia, without a future and money and you are afraid to go to the other towns because you might be arrested, what will you do then? Unless you have your place in the society, you would like to fight against it," Leighty said. He believes that it is dangerous without amnesty, as the "people want to be reintegrated in the society and unless this is allowed to them they will seek an alternative. The adoption of Law on amnesty will be the biggest factor of stabilization in this country in the future. EU AND WORLD BANK ON DONORS' CONFERENCE FOR MACEDONIA. Head of the European Commission Delegation to Macedonia Jose Manuel Pinto Teixeira, on behalf of the Euro-Commissioner Chris Patten, informed the Macedonian Prime Minister, Ljupco Georgievski about a decision for holding a Donors' Conference for Macedonia on March 12. "The Macedonian authorities have made a significant progress in implementing of the Framework Agreement, which ended the conflict in August last year. The Parliament adopted the constitutional changes and the Law on Local self-government, in compliance with the Framework Agreement, a joint statement of the European Union and the World Bank reads. "The authorities has also completed the negotiations with the International Monetary Fund on the Staff-Monitoring Program, which started in January this year. Due to this progress and replying to a request of the all involved parties in the Framework Agreement, the European Commission and the World Bank are going to organize a Donors' Conference for Macedonia on March 12, 2002, in Brussels. The aim is to meet the needs for macro-financial assistance and reconstruction of the conflict-affected areas, as well as for support to measures that are to be undertaken for implementing of the Framework Agreement, the joint announcement reads. THIRD MEETING OF MIXED WORKING GROUP OF MACEDONIA AND EU BEGINS. In organisation of the Macedonian Justice Ministry, the 3rd meeting of the mixed working group of Macedonia and EU for reform and harmonisation of the national with the European legislation is held in Skopje. Government's Deputy Premier Zoran Krstevski, Justice Minister Ixhet Memeti and Head of European Commission delegation in our country Jose Manuel Pinto Tesheira opened the meeting yesterday. Vice Premier Zoran Krstevski said that the Working Group was one of the supplemental bodies of the council for cooperation between the Macedonian Government and the EU, where estimates for the progress of our country in the process of accordance of national legislation with the one of the EU were given, the reform of the public administration and the judicial system, as well as improvement of their efficiency. Emphasising the positive and constructive role of EU in our country, Krstevski referred to the results from the implementation of the Framework Agreement, before all the constitutional changes and the passing of the Law on local self-government. "The future positive steps and perspectives of the country are in immediate correlation with the expectations from the announced Donors' Conference scheduled for March 12 in Brussels, which is co-organised by the European Commission and the World Bank", he said. Krstevski informed that the Macedonian Government prepared the basic strategic documents for following and coordination of the implementation of the EU Stabilisation and Association Agreement in the first half of the previous year. "It would be a real estimation, if I said that the negotiations for full-fledged membership of our country in EU would start in 2006, with previous fulfillment of needed criteria, and especially a strong political interest from the Union and its member-countries in relation to the Republic of Macedonia", Krstevski said. Justice Minister Ixhet Memeti said that due to providing consistency of the legal system, the global objective of the Macedonian Government was harmonisation of the legislation with the one of EU. As Memeti emphasised, the main objectives of those activities were "accordance of right with the Macedonian Constitution, determination of the priorities and possibilities for adjustment of the Macedonian legislation with the European one and future improvement of the legal bases for functioning of the market-oriented economic system". The Head of European Commission delegation Pinto Tesheira pointed out the accordance of the Macedonian legislation with the one of the EU "as a process for stabilisation of the situation in the country". Economics and Politics in Macedonia. In Macedonia, it's an unavoidable fact that economics and politics are connected – and often in rather interesting ways. There are few people as qualified to speak on this subject as Dr. Sam Vaknin. An Israeli who has lived and worked in the Balkans since 1991, Dr. Vaknin is the former economic advisor to the government of Macedonia and a business correspondent for United Press International (UPI). (Dr. Vaknin's collected articles are available on his website.) He has both the insider's knowledge and the analytical skill to cast light on a decidedly murky area. I was fortunate enough to get Dr. Vaknin's thoughts on a number of important issues relating to the effect of war on the Macedonian economy, the effect of foreign intervention and investment, and other current topics of importance. His answers proved candid, well-informed and comprehensive, and are a must-read for anyone interested in Macedonia and its economic future. CD: Your article, "Greeks Bearing Gifts" presents strong evidence for the wholesale buyout of the Macedonian economy by Greek firms. Is this a concerted action, backed by the Greek state, or should we understand it as merely the outcome of the more robust competition of certain Greek companies, as compared to their rivals? SV: It is neither. The closest model I can think of is Japan's MITI. The Greek government sets global goals of regional economic collaboration and identifies key sectors to be targeted (banking, infrastructure, telecommunications). It assists Greek businesses interested in investing in the Balkans. It gives them favourable tax treatment, diplomatic succor, intelligence, introductions to key decision makers, political risk insurance of export transactions, and so on. There is nothing unusual in all this. The USA does the same (even more aggressively so). What is unique in Macedonia's case is that Greece refuses to recognize the country which happens to be a major target of its investments. This lends the whole process a sinister air of a hostile takeover. Greece doesn't even have an embassy here (only a liaison office)! 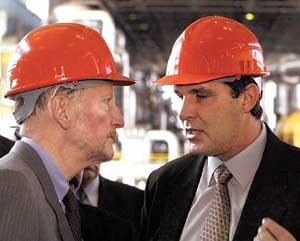 CD: Let me refer to a very interesting report on the Macedonian economy. It discusses the imposition in 2001 of a tax on purchases – the so-called "war tax." The tax, it is stated, will only continue through 2001. Has the tax been successful? SV: I am the "father" of this tax (I proposed it in a negotiating session with the IMF and worked out its details later) – so I could hardly be expected to be unbiased. But, yes, I think it did achieve its goals. The IMF was very keen on its extension because it plugged the ominous hole in the budget (equal to 9% of GDP, later reduced). Its distortionary effects are minimal because it is levied on all types of transactions – though it does tend to drive large financial deals into the informal economy. CD: Has the tax's performance followed any clear patterns? Can the Macedonian "war tax" be compared to similar ones in other wartime economies? SV: It reversed the budget position. Without it, the finances of Macedonia would have been unsustainable. It was based on an in-depth study of laws implemented in other countries, including Israel. CD: The same report gives the details on Macedonia's payment plan. Who were the sponsors of this plan, and how was it engineered and agreed to? SV: Like almost every other major economic reform in Macedonia until 1999, the reform in the payment system is the result of combined pressure by the EU, the IMF, and the World Bank. It was the subject of fierce opposition by entrenched interest groups whose venality overcame their alleged zeal for market reforms. The ZPP was a cash cow, milked by its employees, as well as by all previous administrations. Finally, after years of interminable feasibility studies and bloated committees, the reform was successfully implemented. But it took a lot of infighting. The banks themselves – the ostensible major beneficiaries of the reform – placed major obstacles on the way to the abolition of the payment functions of the antiquated and corrupt ZPP. They claimed repeatedly not to be ready, to lack infrastructure and expertise and so on. CD: The payment plan is designed to "harmonize" the Macedonian economy with Europe's and to help attract foreign investors. In light of the experience with the Greeks that you analyzed, is more foreign investment necessarily a wise thing for Macedonia? 1. A level playing field. Too often, foreign investors collude with corrupt local politicians to rob the state of its assets, to thwart competition, to secure privileges, or to reverse economic reforms. 2. That the investor commits itself to the transfer of technology and knowledge to the host economy. Investment without education of domestic manpower – is colonialism and mercantilism. 3. Not everything should be up for grabs. Certain defense industries, some infrastructure, certain natural monopolies, a few infant industries in need of temporary (and very limited) protection – should be made unavailable to foreign capital. CD: No Macedonian I spoke with uses banks. They cite low confidence in both the currency and in accountability of the banks. Does Macedonia have any safety structure, like America's FDIC? The solution is, of course, to allow competition into the sector (especially by foreign banks), to remove the inept Macedonian managements and replace them with outsiders, to strengthen the bank supervision and separate it from the National Bank of Macedonian (NBRM). Some steps have been taken in this direction lately, but not nearly enough. CD: War in Macedonia was bad for most sectors of business. The increased lawlessness of some sections of the Kosovo-Macedonia border, however, seems to have enhanced conditions for criminal activity. The war was a boon for arms smuggling, what with soldiers to equip, and traffic in women, what with the arrival of large amounts of NATO and other international personnel. Is there any way of quantifying the effect of war on illegal business? And is it a loss for only Macedonia, or Europe in general? SV: Macedonia is too negligible (economically) to have any kind of impact on Europe. It is lucky to have an informal ("black") economy. It is the only vibrant, viable, and job-creating sector in an otherwise moribund scene. In a way, Macedonia was "serendipitous" to have been involved in the Kosovo crisis of 1999. I think that the net effect on its economy was beneficial (in terms of NATO/UNMIK spending in the local economy, foreign aid, grants, foreign credits, the stabilisation and association agreement with the EU, and so on). Not so this last conflict. It took place on its own territory. It obliged Macedonia to increase its spending on defense and internal security. It hindered its access to important local markets (e.g., Kosovo). It consumed very scarce resources, ruined its foreign trade, scared away investments in the pipeline. It cost Macedonia well in excess of $500 million (or c. 15% of its GDP). It has been devastating. Moreover, this conflict will have a lasting adverse impact on ethnic relations, trust in democratic institutions and in the political class, and on future interaction with foreigners and the outside world. Macedonia has become an unpleasant place: radicalized, tense, xenophobic, violent, fractured. Social networks and social safety nets as well as social solidarity have crumbled. Economics is a branch of mass psychology. A traumatized and pathologized nation is unlikely to produce a healthy economy. CD: So when we get down to it, is this conflict about economics or about politics? "Albanians and Macedonian crime gangs (in cahoots with kleptocratic and venal local politicians) regard Macedonia as a vital route for drugs, stolen cars, smuggled cigarettes and soft drinks, illegal immigrants, white slavery, and weapons dealing. These criminal activities far outweigh the GDP of all the adversary states combined. This conflict is about controlling territory and the economic benefits attendant to such control. "Crime and war provide employment, status, regular income, perks, and livelihood to many denizens of Macedonia, Albania, and Bulgaria. They constitute an outlet for entrepreneurship, however perverted. Fighting for the cause and smuggling often means travel abroad (for instance, on fundraising missions), five-star accommodation, and a lavish lifestyle. It also translates into powers of patronage and excesses of self-enrichment. "Moreover, in ossified, socially stratified, ethnically polarized, and economically impoverished societies, war and crime engender social mobility. The likes of Hashim Thaci and Ali Ahmeti often start as rebels and end as part of the cosseted establishment. Many a criminal dabble in politics and business. "Hence the tenacity of both phenomena. Hence the bleak and pessimistic outlook for this region. The 'formal' economies simply cannot compete. Jobs are not created, the educated are often bitterly idle, salaries are minuscule if paid at all, the future is past. Crime and politics (one and the same in the Balkans) are alluring alternatives." CD: One of the incentives for Macedonia to make peace with the NLA was to hold a donor conference. Yet this conference has been postponed at least four times. Can you explain why? SV: The West has no choice but to reward Macedonia for its "flexibility," in a generous $200 million donor conference. It has been the explicit carrot at the end of the EU (and, to a lesser degree, USA) stick. It was postponed one time too many last month, but it will take place. It will be "successful." And it will prolong the Macedonian addiction to aid. Development aid and international credits have come to be regarded by Macedonians as tools of extortion and manipulation. To some extent, they are. What should have been a purely economic matter has been entangled with political and geopolitical agendas. Whether Macedonia should or should not receive aid and loans should be determined solely by how far its structural and institutional reforms have progressed, how it preserves its macro-economic stability, how receptive it is to the private sector, how untainted is its privatization, and so on. Regrettably, Macedonia is a drug addict. Its drug is "aid," "credits," "donations," "charity." It is more adept at lobbying foreign politicians for handouts than at developing its economy. It has become an expert at self-pity and exaggerated grievances. It uses the enormous infusions of money it gets to line the pockets of its politicians or to to indulge in the consumption of imported goods made attractive by an unrealistic exchange rate. The West has created another dependency in the Balkans – the Third Protectorate after Kosovo and Bosnia. CD: Finally, how would you characterize Macedonia's relations with international bodies that have economic influence, like the IMF, World Bank, and European Union? SV: The EU has been undermining the IMF consistently – and so, to a lesser extent, has the World Bank. They dole out cash and credits to Macedonia, knowingly exacerbating its addiction and the insatiable venality of its politicians. This way, they "reward" Macedonia for painful political concessions and "motivate" its politicians to "cooperate." These funds, dispensed with after each phase in the implementation of the Framework Agreement, come with no strings attached, unsupervised, without proper governance clauses. It is intended to bribe – rather than to better. And it destroys everything the international financial community has achieved here in the last decade. Simeon Insures Himself against Failure. Four are the important conclusions which could be made after the PM's speech on Saturday concerning his views for the future. 1. There may never be such party as NMS. Postponement is the mother of rejection. For now the NMS as a structure is a parliamentary group, which took a decision to turn into a party. The non-formal leader, after whom the movement is named, hasn't expressed his opinion on this question. And he doesn't depend on formalities to be a leader. Even more, being a king it was a historic necessity to become a PM, but to become a unifier of the nation through a party, means to go to the level of the other Bulgarian politicians. But their level is not high and could be fatal for the image of Simeon II. 2. The PM imagines his party in quite a different way as far as his associates' ideas are concerned. Till now they spoke about 'electoral type of formation', i.e. something like closed political club, which is expanding. Simeon Saxe-Coburg-Gotha entered into contradiction with the organizers saying that he wants 'the registered members of the movement to be as many as possible and to represent all the regions and strata of the Bulgarian society'. There's no such a demand as one not being a member of another party. A movement which will comprise independent people, socialists, UDF members and agrarians undoubtedly is most fully corresponding to the idea of Saxe-Coburg-Gotha about an unifier of the nation, a role he for sure wants to play. 3. Even if such a party is established the PM could easily distance himself from it. The unwillingness of the king to head a quasi-party structure is well explicable. If the NMS doesn't justify the trust of Simeon and the people, the PM could easily distance from it. Then the movement will turn into a concrete without cement. And this will mean new elections with other MPs, but the same leader. With the new move of a grand master Simeon played safe in case of a possible failure of the formation. 4. The PM hasn't a favourite among his associates. Everybody was surprised by the development of the events on Saturday. It was obvious that neither associate Prof. Plamen Panayotov, nor Dr. Atanas Shterev, who paid for the hall, or chief of the PM's cabinet Stoyan Ganev knew what would happen. But the speech of Simeon wasn't an improvisation - he was reading it. Which means that the PM takes the most important decisions all by himself, not warning anybody about them. The conclusion is that everybody who describes himself as Simeon's confidential man is a braggart. I Don't Jump and Change My Opinion. I'm a conceptual man. You already know me - a quite boring one. I don't jump and I don't change my opinion in accordance with the day or the mood. The things I saw in the NPP impressed me deeply. An argument, and a solid one, that we would have before Europe would be the regulatory organ to be independent and with authority on the negotiations. When I was asked the question after my meeting with Costas Simitis I said what I thought. I think that it's normal - we try to observe the commitments taken by the previous governments. The referendum is a quite special topic. It should be estimated what is the most proper way for everybody to express their opinion. I consider the theme on Bulgarian nuclear energetics a quite consensual one. I Don't See the Point in Ministerial Reshuffles. Simeon Saxe-Coburg-Gotha before journalists at the 'Kozloduy' NPP. I listened to the news at 6 a.m. and to put it frankly I was very surprised of the so called press review. There were titles on topics that are too far from reality and I was embarrassed. Because may be people who are not informed would ask themselves quite alarming quesions, after reading or hearing this. Let's not seek for polemics. I said that there were some ministers who...but let's not repeat. That doesn't mean any resignations, for instance. We speak in a normal way. I don't see the point in any ministerial reshuffles. The things will be solved much easier if we don't seek for polemics everywhere. President and PM against Referendum for the NPP. The decision for the Third and the Forth units of the NPP will be taken in March. I didn't say that we'll close the Third and The Forth reactor in 2006. We'll try to take into consideration the things which Europe demands. The referendum is quite special topic, it should be estimated what is the most proper way in which people could express their opinion. I am convinced now that some of our neighbours are groundlessly troubled by the nuclear safety, PM Saxe-Coburg-Gotha said after his meeting with the citizens of 'Kozloduy' yesterday. The meeting ended sooner than it was envisaged. Half of the town met him at the square. For the first time people hissed him. They carried posters which read 'Make a Referendum to Save Us!' and 'With the NPP - an Energetic Center, without the NPP - a Center of Misery!'. Not earlier than the middle of March when the energetic strategy will be ready, a decision about the fate of the Third and The Forth reactors will be taken, Simeon said. 'The referendum isn't the best way for taking a decision about the NPP. I'm ready as head of the state to meet my responsibility and not to search such a way for taking the decision', president Georgy Parvanov said in Razgrad. To him the responsibility of the politicians shouldn't be transferred to the people. BG and Russia to Sign New Visa Alleviations. Five fresh consulate offices to be opened to facilitate tourists to Bulgaria. Alleviation of the visa regime for Russian tourists will negotiate Foreign Minister Solomon Passy during his visit to Moscow. He will pay a visit to the Russian capital city from January 30 to February 1 at the invitation of his counterpart Igor Ivanov. The Russian tourists can take visas directly at the border, the agreement envisages. Five new Bulgarian consulate agencies will be opened also to facilitate the Russian citizens, 'Standart' learnt. The Russian diplomatic realties is the other topic in the agenda of Minister Passy. The discussion will continue at the sitting of the joint Bulgarian - Russian commission on February 21 and 22 in Sofia. The visit of Foreign Minister Solomon Passy is a preparation for the pending visit of Premier Simeon Saxe-Coburg-Gotha in Moscow. Before that, however, Genadii Seleznyov - chairman of the Russian Duma, is expected to pay visit to Bulgaria in early-March. Oil Pipe-Line to Pass Via Neftochim. The working group will sit tomorrow in Moscow. Bourgas - Alexandroupolis pipe-line's course will pass through the ground of LUKoil Neftochim, said yesterday experts from the Ministry of Regional Development and Public Works. The working committee comprises representatives of Bulgaria, Greece and Russia, and had discussed 3 options. The requirement of the chairmanship of the Bulgarian refinery was approved so far. LUKoil Neftochim will be one of the major investors from Bulgaria. The working committee will hold its successive session tomorrow in Moscow. Bulgaria will insist on 25-percent interest, to be established by private-run companies. The consultants from the German ILF will submit the assessment of the researches for the second stage of the project. The transit taxes and their allocation within the states will be debated anew. The Bulgarian party has already required higher share of the fees of transit, since the oil is running longer course in our country. General Borissov:Intrigues and Anarchy Impede the NSS. Leakage of confidential information from the counter intelligence service. National Security Service is characterized by a decline and uncertainty which is disastrous for such a service, IM chief secretary General Boiko Borissov stressed after yesterday's report of the counter-intelligence. Personal intrigues impede the activity of the NSS and its coordination with the other national services within the IM, the general added. In his view the major fault of the NSS is that it still has no regular chief. According to deputy interior minister Roumen Stoilov there is a leakage of confidential information from the NSS. We aren't satisfied with the activity of detecting economic crimes, as well as of the interaction with the NSOCC and Border police, Stoilov added. The problems within the National Security Service are not a result from the absence of a regular chief, they've been existing for a long time, President Georgi Parvanov stressed during his visit to Razgrad yesterday. Candles In Memory of 'Indigo' Victims. Hundreds of candles will burn today in front of 'Indigo' discotheque at 18:30PM. Relatives, schoolmates and ordinary people will gather to pay respect to the memory of Lyuba, Krissi, Mitko, Madlena, Eli, Vicki and Tsveti. A month ago, just at that time the seven children were stamped upon at the discotheque's entrance. Relatives and schoolmates will commemorate the ridiculously sacrificed lives. Some of the distressed parents will come for the first time in front of the discotheque. King Slapped Someone In the Face, But I'm Not Telling Who. Ministers themselves have to put their tasks under parliamentary discussions, says Nonka Matova, NMS deputy. - Mrs Matova, how do people from your constituency comment on the unsuccessful constituent conference of the NMS that took place on Saturday? - With respect and appreciation for His Majesty. He captured all hearts with his speech. - To you, whom did he slap in the face? - There was whom to. Let's not name anyone. - Do you think, that sanative processes are to be catalyzed within the NMS after January 26? - It is logical. In the long run, His Majesty came to make Bulgaria into a little Switzerland, as he himself put it. In this line, in the West, as well as in the East, resignations are handed. And people bear responsibilities. - Do you think, that there was an implication for resignations in the speech delivered by the Premier? - I think that we, after all, should learn to assume responsibilities and to have a sense of honour. - Will you ask for Plamen Panayotov's resignation? - I'd rather say that he, as well as the parliamentary leadership, should show more sense of honour and dignity, for the things not to come to requiring resignations. - How could they show their dignity: by putting ashes on their heads? - Putting ashes on their heads is a needless procedure. By experience, the situation in Bulgaria is a special one. As for the manners of the people, though I do not want anyone to take offence, especially of those who have graduated in law. Maybe they lack practice or have different habits, but everyone, being aware of one's own capacity, should know better and master better ways of communication. I'm not making any accusations against anyone. We should just show more respect both for the others and the voters. - What impressions did the people from your constituency get of how the ministers cope with their work? - The ministers should assign tasks to themselves for the next month or three months and inform the parliament about their performances. To put their tasks under discussions. Anyway, should a particular thesis be developed at all? The way it is with the privatization. People are scared so much with this process. Why would the bearing plant in Karlovo, for example, be privatized, if it is making profits? Though, this issue is a political one. BULGARIA - PRESIDENT - DEFENCE INDUSTRY. President Purvanov Committed to Defence Industry Development. President Georgi Purvanov pledged Tuesday to commit efforts to address the problems in the defence industry and to assist military repair plants in regaining their economic positions. Purvanov met with the management and workers of the Khan Kroum plant in Turgovishte, run by Terem EAD. On Monday, Purvanov started his first domestic tour as head of state, which covers Razgrad and Turgovishte regions. The Terem company was established by order of the Council of Ministers of April 1998 to supersede the Military Industry Department. Purvanov promised to urge the Defence Ministry to consider public procurement projects which may be commissioned to Khan Kroum. In 2001 the army did not commission any such projects to the plant, which has been operating at minimum capacity for years. An initiative approved by Defence Ministry experts at the end of 2001 to transform Terem EAD into a holding company will provide more independence for the separate enterprises in their efforts to survive, the President said. Purvanov and the plant Director Valentin Tahchiev considered concrete projects to ensure better international market positions for the national defence industry. Sofia Will Continue to Provide Military Assistance to Skopje. Sofia, January 29 (BTA) - Bulgaria will continue to provide military assistance to Macedonia, Bulgarian Defence Minister Nikolai Svinarov said after his Tuesday meeting with Macedonian counterpart Vlado Popovski. The latter is here on a two-day official visit. Svinarov specified that the parameters of the military assistance will remain unchanged with the exception of heavy weaponry. Popovski said his country does not need more heavy weaponry but munition, training and exchange of experience in converting the army from the conscription to the professional principle. Bilateral military cooperation will be framed by the protocol for cooperation in 2002 signed on Tuesday by Svinarov and Popovski. Both countries have applied for NATO membership. Macedonia can borrow from Bulgaria's experience in building the legislative groundwork for national defence and security, Popovski said, emphasizing the assistance Sofia rendered to Skopje which played a major role in ensuring Macedonia's sovereignty. Asked if the crisis in Macedonia could be reignited this spring, Popovski said that if indeed this happens, the crisis will not be on the same scale as before due to the different situation in the country. He pointed to the implementation of the Ohrid agreement and the amendments to the constitution as developments that support his theory. In his view, the Macedonian Alabanians do not support a new military offensive. Bulgaria sent Macedonia 94 T-55 tanks and 108 122 mm M-30 howitzers between May and November 1999 in pursuance of an April 1999 cooperation agreement. Bulgaria and Macedonia signed on March 7, 2001, an agreement on military and technical cooperation under which Skopje got 16 million leva's worth of munition and spare tools. Popularity of Bulgaria's prime minister in decline. SOFIA, Bulgaria - The popularity of Bulgaria's government has dropped sharply in the months since it came to power last year, polls suggested Tuesday. The results are considered problematic for Prime Minister Simeon Saxcoburggotski, who is also the country's former King Simeon II. He returned to Bulgaria last year to huge crowds of enthusiastic supporters after five decades in exile. However, confidence in his government fell by 13 percentage points from 62 percent in December to 49 percent in January, according to the Alpha Research polling agency, which carried out the survey. The survey, carried out last week, had a margin or error of plus or minus 3 percentage points. No further information about the poll was released. Though the poll did not directly question people about their feelings about the prime minister, the results suggest trouble for Saxcoburggotski because he is viewed as the public face of the government. Saxcoburggotski's National Movement Simeon II won half of the 240 seats in parliament in last June's general elections and formed a coalition government with a small party representing the country's ethnic Turkish minority. Since those months of euphoria, the country has had to face tax increases and price hikes for heating and electricity. A separate poll published Tuesday also suggested that the government is losing support. According to the Institute for Marketing and Social Surveys, the ruling party would get 20 percent of the votes if elections were held now. In June, the party won 43 percent of all votes. The poll was conducted among 1,245 Bulgarians between Jan. 21-25. No margin of error was provided. Bulgaria and Macedonia signed a protocol for military cooperation. Visiting Macedonian Defense Minister Vlado Popovsky and his Bulgarian counterpart Nikolay Svinarov signed a protocol for military cooperation for 2002. According to Nikolay Svinarov, the document does not stipulate sending heavy weapons to Macedonia. Speaking for News.bg Agency, Popovsky said that the document treats issues concerning cooperation in legal maters and training Macedonian officers. He thanked Bulgaria for the help sent last year during the crisis and added that the crisis would not happen again. Petre Mihailesku invited Simeon Koburg-Gotha in Romania. The Minister in charge of the Chief Secretariat of Romanian government Petre Mihailesku invited Simeon Koburg-Gotha on behalf of the Premier Nastase to visit Romania. Petre Mihailesku is in Bulgaria on an unofficial visit by invitation of the Chief Secretary of the Cabinet Mavrov. After his meeting with his Romanian counterpart, Mavrov said that Bulgaria needs an efficient Ministry of State Administration to controll local authorities. Both officials said that state administrations in their countries are encountering serious difficulties in coordinating municipalities with central power. They also discussed administrative reform in Bulgaria and Romania and the roles of Chief Secretaries in the respective Ministries, as well as Kozloduy Nuclear Power Plant. According to Sten Ask, Bulgaria would be assessed individually. Swedish Ambassador Sten Ask said that his country would insist that every candidate country for European Union membership should be assessed individually and should be provided the opportunity to catch up with the other candidates. He was the host of a luncheon devoted to efforts of Bulgaria to become a member of the European Union that was attended by the Chief Negotiator Miglena Kuneva, the Chairman of the Foreign Policy Parliamentary Commission Daniel Valchev, and by representatives of companies, parties and non-governmental organizations. 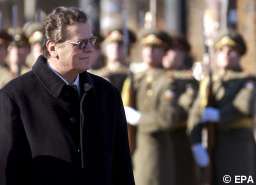 The Ambassador did not comment whether eventual membership would be connected to closing down Kozloduy Nuclear Power Plant reactors, and said he would visit the plant and would meet Milko Kovachev. As al-Qaida prepares its next move, the House of Saud is desperate to get US troops to leave the Arabian peninsula. Relations between the United States and Saudi Arabia - the pivot of American power in the Middle East - are at breaking point. Although the recent call for the US to pull its troops out of the country was attributed to an "anonymous Saudi official" in the Washington Post, no one can doubt the seriousness of the breach between the two allies, nor the scale of the potential fallout from a rupture. The growing conflict is a manifestation of the very artificial nature of those relations. After all, what would make an open secular democracy, like the US, maintain a strategically close and intimate relation with a secretive and zealous absolute feudal monarchy like Saudi Arabia? In the beginning, it was simple: oil was the whole story. There were no reasons for any conflict or embarrassment. Later, as US involvement grew in the Middle East, Saudi Arabia was declared an area of vital interest. But even then, the US was wise enough to understand the sensitivities and avoid an open physical presence in Saudi Arabia. But after the 1990 Gulf crisis, the US crossed the psychological barrier by bringing in their forces. They failed to remember the sensitivities. Worse, the Saudi government was never brave enough to remind them. Contrary to the usual assumption that American troops are protecting the royal family, the royal family is in fact protecting these troops. Politically, American troops are still officially in the country at the request of its rulers. From a religious point of view, the official clergy's Gulf war ruling that they are guests has never been reversed. In terms of security, Saudi security forces are watching, rounding up and trying to eradicate groups which might target the Americans. But what was effective in the early 90s is no longer so. The regime's legitimacy has been drastically undermined, not least by the presence of these troops, while the religious establishment is no longer credible because of its support for the regime. Meanwhile, the loyalty of the security forces is now seriously in doubt. The regime knows that Osama bin Laden is very popular in the country (a classified US report of a Saudi intelligence survey of educated Saudis between the ages of 25 and 41 in October found that 95% supported Bin Laden's cause). Any pressure on the security forces to "do their job" would backfire. The Saud family was well aware that the presence of American troops was a huge political liability even before the September events. The consensus then was to avoid trouble with the Americans. But since September, the issue has become an even more powerful weapon in the hands of Bin Laden supporters. The regime has found itself in an increasingly difficult situation. It wanted to get rid of this liability but knew that, for the Americans, any talk of withdrawing the troops would be regarded as a reward to Bin Laden and a victory for terrorism. The issue became even more sensitive with the American attack on Afghanistan. Although the regime did its best to stay in the American orbit, the public mood in Saudi Arabia was massively supportive of Bin Laden and hostile to the US. Relations were complicated by the media campaign in the US against the Saudi royal family. But with the apparent success of the American mission, the timing seemed right to float the call for a troop withdrawal via an anonymous source in an American newspaper. Let it be understood that the House of Saud does not base its decisions on principles, national pride, sovereignty or religion. They calculate things according to a balance, which keeps them in power. They are desperate now to appear before their people as rejecting the American military presence. But it is unlikely that the Saud family rulers will ever be brave enough to go public with the request. It's more likely that they will agree with the Americans how to get the forces out without giving Bin Laden any credit. Indeed, a senior congressman has already said that US forces may have to be moved out because of the socially harsh conditions they face. It also needs to be remembered that the American presence is not only of uniformed troops. Probably the paramilitary, civilian backup, and the command and control and logistical set-up are more important to the US. The Americans are already convinced that the troops can be transferred elsewhere with minimal or no loss in military advantage, but they cannot afford to abandon these other assets unless they are compelled to. Finally, it is unlikely that any withdrawal will take place while plans to attack Iraq are still live. American troops in the kingdom would be vital to such an operation. All such expectations depend on the assumption that al-Qaida has been paralysed or destroyed. But if what is being said by circles close to al-Qaida about a major impending attack on the US or Saudi Arabia is true, then the situation is likely to change completely, with unpredict- able consequences. It all depends on the nature, timing and scale of such attacks. - Saad al-Fagih is a leading exiled Saudi dissident and director of the Movement for Islamic Reform in Arabia.